AirPods were a storm of a success for the company, so naturally it's keeping the momentum going with the AirPods 2. Well, that's what we're calling them; Apple just refers to the refreshed earbuds as the AirPods. The new model is available to buy right now, but what's actually new here? At first blush they look identical to the previous version of the hearable - so why are there now two models to choose from? Should you even upgrade if you already own a pair of Apple's wireless earbuds? We'll explain all in this guide as we pit the old and the new against one another. Spot the difference. No really, just try. Take a glance at the refreshed AirPods and you'll wonder if anything has changed here at all. Which may surprise you when you consider how divisive the design has been. But while the AirPods may be Marmite for the ears, Cupertino thinks there's enough of you who love them. One change you will see is the new LED on the front charging case, which indicates the battery life of your earbuds. This is inside the case on the older model. Talking of that case, you can now choose to buy one that supports wireless charging. If you do, you'll be able to plonk the case on any Qi wireless charger and power it up. With the AirPods, the wireless charging case brings the total price to $199, but for $159 - same price as the original - you can pick up the AirPods 2 with a case that relies on good old fashioned Lightning cable power. Got a pair of AirPods and just want the wireless charging? Apple's selling that wireless case separately for $79. The AirPods were pretty light on features, which is why we didn't classify them as a true "hearable". 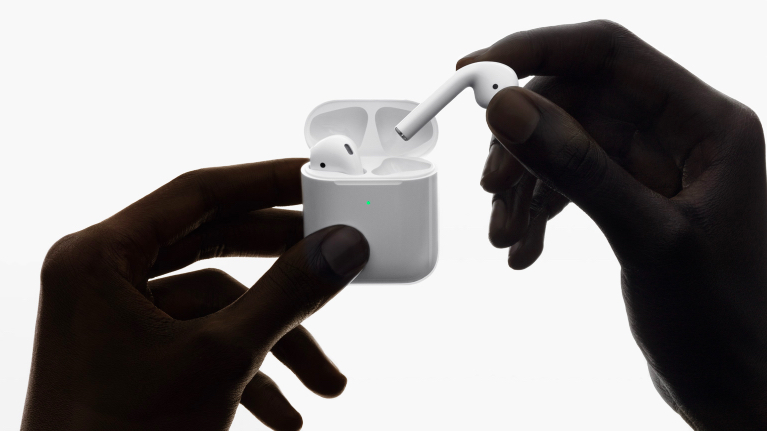 The AirPods 2 take a step forward with Apple's new H1 chip, which now grants you the ability to invoke Siri hands-free. With the first-gen model, you needed to double tap the AirPods to get Siri to listen, but now you can just say aloud "Hey Siri" - and Apple's assistant will perk up. This could be the key differentiator, as we found Siri to be more of a nuisance than useful on the first AirPods, mostly because every time we fumbled with them in our ears we seemed to wake it up. You can still use the double-tap feature if you like, but hopefully we can just leave it off and reduce the number of false wake commands. Apple says the H1 chip will also make the AirPods faster at making calls and switching between devices, with a 30% reduced latency when used in games, it claims. So while the AirPods 2 don't add many more features, they should perform better and generally give Apple's earbuds a more polished feel. We've already talked about the new charging case, but the improved processor will also have a positive impact on the battery. Although the quoted amount of battery life is still five hours, with 24 additional hours from the charging case, you'll now get 50% more hands-free talk time. That means you should get up to three hours of talk time with these, compared to the two hours of the first generation. Considering phone calls are a prime AirPods use case for a lot of people, that's going to be a welcome improvement. When comparing the two on price, as we said, the new AirPods 2 start at the same $159 price as the first model, with the option to pay $40 more for the wireless charging case. If you're someone who already charges your phone wirelessly, this may be worth it - especially if you're holding out for Apple's AirPower charging mat. The verdict doesn't so much come down to AirPods v AirPods 2 - the winner here is clear - as it does the AirPods 2 with wireless charging case versus non-wireless charging case. Because as of right now you can only buy the second-gen model anyway, which costs the exact same as the first unless you opt for the wireless pill box. However, while the AirPods 2 aren't a huge leap forward, they do add plenty of spit and polish. The new H1 chip makes this a doozy, and means the AirPods 2 are a better Siri communicator.